Sue Brown Hays. Go Down, Death. New York: Charles Scribner’s Sons, 1946. Sue Brown Hays. Go Down, Death. London: Hammond, Hammond & Co., 1948. Sue Brown Hays was the descendant of several generations of Mississippi and Louisiana cotton planters. 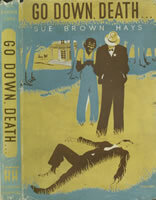 In Go Down, Death, her protagonist is a former New Orleans reporter, now housewife, who leases Rutledge Hall in the fictional Mississippi town of “Riverton.” Soon afterwards a series of murders occur in and around the estate. The denouement reveals that the home’s owner committed the crimes in an effort to hide the mixed-race heritage of his wife. 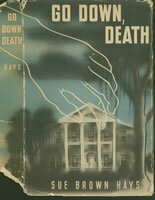 Exhibited are the 1946 American edition and the 1948 English edition. Born in Greenville, Mississippi, Louise Eskrigge Crump was the society editor of her hometown’s newspaper. In The Face of Fear (1952), the narrator holds a similar job when Sadie Eaton, “the richest and stingiest woman in Eatonville” is mutilated and killed. Crump dedicated her novel to Hodding Carter, the Pulitzer Prize-winning editor of Greenville’s Delta Democrat.